Can China’s birdwatchers and North Korea’s economy save migratory birds from extinction? Habitat loss for shorebirds in the Yellow Sea is rapid but all is not lost on the Flyway. Can China’s new generation of birdwatchers and North Korea’s weak economy save migratory birds from extinction? 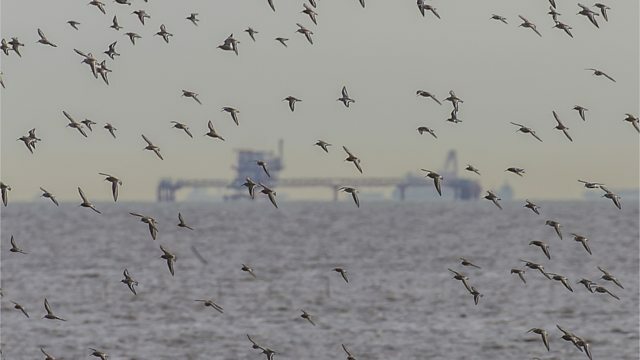 Habitat loss for shorebirds in the Yellow Sea is rapid as the mudflats on which they depend are converted to farmland, factories, ports, oil refineries and golf courses. But all is not lost on the East Asian Australasian Flyway. Ann Jones travels around the northern end of the Yellow Sea, talking to the world’s leading shorebird researchers and Chinese nature lovers about their concerns for the Flyway’s future. They discuss their feelings for the long distance migration champions of the natural world, like the Eastern curlew and bar-tailed godwit. Ann also meets the New Zealand conservationists who have just emerged from North Korea with good news about the birds. The series is a co-production from the BBC World Service and Australian ABC Radio National. Additional recordings were provided by the Macaulay Library of Natural Sounds at the Cornell Lab of Ornithology. Produced by Andrew Luck-Baker and Ann Jones. Curlew sandpipers coming to one of the few feeding sites left for them along the coast of Bohai Bay in northern China.